A film which tops IMDb’s Top 250 films of all-time, The Shawshank Redemption (1994), is one of the most widely recognised features in modern cinema. With 7 Oscar nominations, Frank Darabont’s adaption of Stephen King’s novella is one of the most successful movies of all time. This crime drama was commercially ignored on release and even the glowering reviews from critics could not rocket this stalemate to success. It was only until it’s VHS release that it received widespread recognition and through word-of-mouth it took the audience by storm with it’s masterfully constructed script, excellent casting and accomplished conclusion. This film will go down in history as a cinematic classic and it certainly asserted Morgan Freeman’s position as one of Hollywood’s best. The story follows young banker, Andy Dufresne (Tim Robbins), who is convicted of murdering his adulterous wife and her lover. Being sentenced to two life sentences, he is sent to the notorious Shawshank State Prison where he begins serving his infinite jail term. After years inside, Andy befriends one of the prisons senior jailbirds, Ellis Redding (Morgan Freeman), or more commonly known as ‘Red’. This spurs a unifying bond between the two and ultimately a wonderfully, unexpected friendships takes shape. Red, who is able to sneak any type of contraband past Warden Norton (Bob Gunton), is asked by Andy for a large poster of pin-up girl Rita Hayworth. This seems like an unusual request but is ultimately a major factor in this beautifully layered production. Andy, with his previous accountancy experience, advises Warden Norton in his future agreements and taxes. On the surface, Andy is doing a clerks job to pass the time whilst serving his life long sentence. However, this is yet another element in his master plan that leaves the audience exasperated, breathless and stunned once revealed. Tim Robbins, who plays Andy, is excellent in his depiction. He portrays a stern confidence that suggests he committed such criminal acts that he so vigorously denies. Yet at times, he conveys a gentleness that makes you question the nature of his character. His quick wit and clever demeanour also make him even more like-able and as an audience you’ll believe his pleas of innocence. Morgan Freeman, who was nominated for an Oscar for Best Actor in a Leading Role, delivered a performance so fantastically ambiguous the audience fall in love with Red and Freeman. At the centre of the movie, he carries the story through the stretch of 1946 to 1967 without the sequence becoming prolonged. Essentially playing himself, Freeman never has to overtly act and his calming voice and gentle attitude amalgamate into the perfect wing-man for Andy’s time in Shawshank. Arguably, the defining role of his career, Freeman evokes such a response that the audience immediately attach themselves to the character. Director, Darabont, does not ponder on Red’s criminal activity that led to his imprisonment, this doesn’t not allow the audiences moral views to be confronted when responding to Red’s character which ultimately leads to him being universally admired. 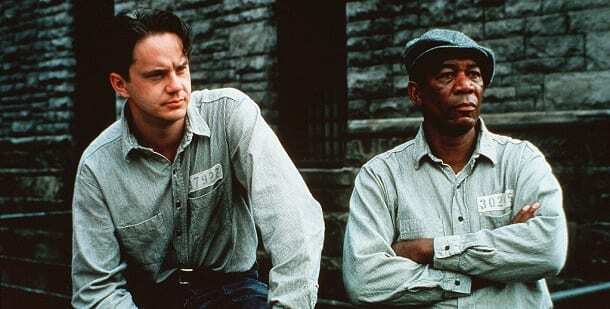 The Shawshank Redemption is a fantastic journey of friendship. Stretching over a number of years it tackles several issues of prison life, love and redemption. It is a film which will not disappoint with an ending that is the perfect summation of the life long tale that you will watch, and fall in love, with over and over again. Olympus Has Fallen is out on the 17th of April, and coincidentally The Shawshank Redemption will be on ITV2 on Friday the 19th April at 9.00PM.